John Taye’s ideas for carving materialize while he pushes a cart up and down the aisle of a grocery store’s produce department. He’ll also mine ideas from drawing and doodling in a sketchbook or observing the world around him. John began carving wood as a boy using a pocketknife and X-acto knifes to make small cars, boats and airplanes. He studied painting while in college and created dozens of still life oil paintings in addition to portrait and figurative paintings. 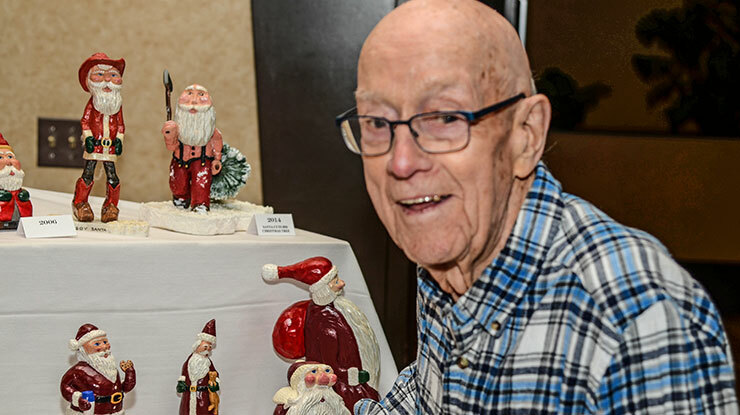 After about 15 years, with some exhibitions and sales, he “hit the wall.” Needing a change, John decided to sculpt his ideas in wood, turning some of his favorite paintings and drawings into carvings. Through his still life carvings, John communicates the beauty of natural forms. Although he did about a dozen of these, John is proudest of Emblems, a still life alder carving centering on bread and water. “This one has religious symbolism, having to do with my faith,” he says. “It is in a collection at the Museum of Church History and Art in Salt Lake City.” That museum also has Reading, a basswood sculpture John carved of his wife, Suzanne, sitting in a chair while reading a Bible. Ninety percent of John’s work is carving by hand, as the only power tool he uses is a band saw to rough out larger pieces. John relies on about a dozen gouges, some chisels, a few carving knifes and numerous wood files and rasps. He cannot do without his duct tape-wrapped lignum vitae mallet he’s had for 30 years. “I don’t mind working a little slower, and I like the process of carving,” he explains. These days, John’s working on some bronze commissions for a new church. He’s also continuing to create a series of woodcarvings relating to transportation and featuring whimsical animals, such as his All-Terrain Vehicle for an Acrophobic Cowboy. Since John is adding some extra elements to these animals they are not entirely realistic, but possess enough detail for viewers to understand John’s interpretations. “People like them and always smile,” he says.